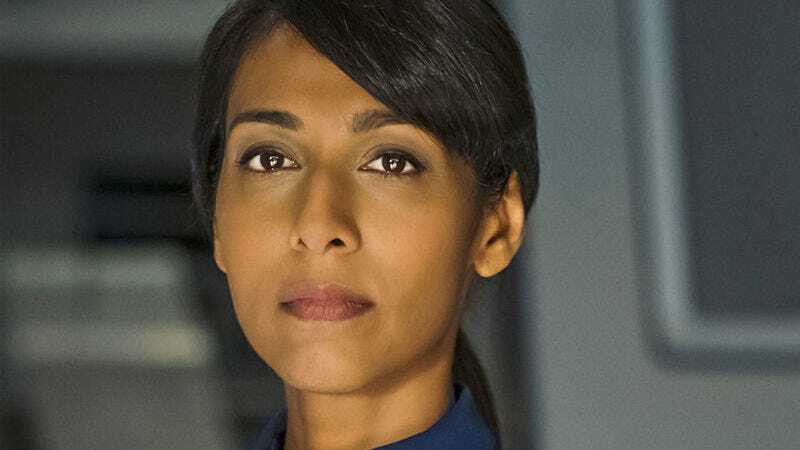 Rekha Sharma, seen here on Star Trek: Discovery, will star in The Telling, based on the novel by Ursula K. Le Guin. Before her passing earlier this year, acclaimed author Ursula K. Le Guin had been working on bringing her novel The Telling to the big screen. Today, the company behind it has announced it’s moving forward on the project, with a scifi favorite along for the ride. Bayview Films has announced that Leena Pendharkar, director of the upcoming 20 Weeks, will write and direct the adaptation. It’s set to star Rekha Sharma of Battlestar Galactica, Star Trek: Discovery, and V fame. Published in 2000, the book is part of Le Guin’s Hainish Cycle universe. The lead character (Sutty Dass, who will be played by Sharma) travels from Earth to study a planet called Aka, where culture and beliefs are outlawed. There is, of course, a resistance on the planet attempting to keep traditions alive. Currently, the plan is for Pendharkar to shoot The Telling later this year for a theatrical release in 2019.